“Hello! This is not my worst cameo! But it comes close…” …said the clone of a general from World War 2. With the DVD release date of Sept. 9 for Season 1 of Marvel's Agents of S.H.I.E.L.D., there's just enough time to watch a couple episodes every day before season 2 begins! And so, a binge rewatch is in order. And from the beginning, there will be spoilers! It has problems. 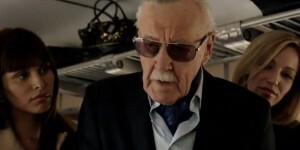 Primarily, Stan Lee. But it also is where the sense of direction for the show really started to be felt. A bigger conspiracy is hinted at, although the scope of it? Well, nothing prepared us for that! What about you? How did T.R.AC.K.S. hold up on a repeat viewing? The rest of this binge rewatch series of articles can be found here. Even on the first time through I thought this episode was great. It had a Mission Impossible vibe to it. They finally remembered that this was a SPY show. To me, the ending was a bit weak, but necessary for the larger story they were building.